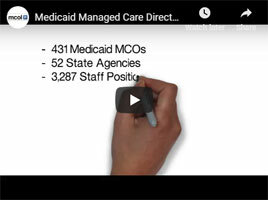 State Medicaid Managed Care Organization Directory with summary information by state including enrollment for 424 selected state MCOs, as well as a listing of 2,717 key relevant staff. National Medicaid Managed Care Organization Directory with seven national offices for Medicaid health plans and 87 key executives listed. Executive Profiles providing contact and biographical information for 68 Medicaid thought leaders and national executives. Indexes for convenient navigation and reference organized by Individual, Organization and Parent/Affiliate company. The 2019 Directory reflects addition of 44 new MCOs, deletion of 32 MCOs that ceased Medicaid contracting; lists 1,902 new staff and deletes 1,729 terminating staff; plus other extensive updates. Leverage MCOL's HealthQuest Publishers' Medicaid Managed Care Directory 2019 to help fulfill your business objectives in the Medicaid Managed Care environment in 2019 and beyond! Find it Online: https://www.managedcarestore.com/yhlthqst/hqmedicaid.htm or Call: (209) 577-4888.